Bases of Operations: Varied (see individual profiles). Some Elders have no (known) base of operations and are mobile throughout the known universe and beyond. Comments: The Collector created by Stan Lee, Don Heck, and Frankie Ray. Everything above this is a VERY-edited version of the Watchers profile. Everything below this was taken from the Comments section of the Possessor profile. So far, 18 Elders have been named but only 17 have been definitively depicted. Of those 17, 8 are human in appearance, 6 are humanoid, 2 are semi-humanoid and only 1 is non-humanoid. Human-looking (i.e. able to pass for human without any significant modifications): Astronomer, "Carina," Collector, Contemplator, Father Time, Gardener, Matani (deceased), Possessor. Humanoid (i.e. can pass for human with minor adjustments): Caregiver, Champion of the Universe, Explorer, Grandmaster, Judicator, Runner. Semi-humanoid (i.e. two-armed bipeds who can't pass for human): Obliterator, Trader. First appearances of the term "Elders." a) The Collector and his daughter ("Carina") both identified themselves as Elders in AVENGERS #174 (August, 1978). The Collector mentioned his "brother (who) sought sport in this continuum, and roamed in search of games to play!" The Collector also specified that the Elders came to "this universe...close in the wake of creation, from whence I cannot say!" b) In AVENGERS #177 (November, 1978), the omniscient narrative on page 12 identifies the Collector as having been "one of the Elders of the Universe." c) The Gardener identified himself as being one of the Elders in INCREDIBLE HULK Vol. 2 #248 (June, 1980). He mentioned two brothers, "one who loved to study, another who engaged in endless sport!" He later referred to Adam Warlock's Soul Gem as "a Soul Gem of the Elder race." d) The Grandmaster first identified himself as being one of the Elders of the Universe in MARVEL SUPER HERO CONTEST OF CHAMPIONS #1 (June, 1982). He also called the Unknown (his nameless adversary) "the eldest of the Elders!" The Unknown was actually Death herself. e) The Champion of the Universe first appeared and identified himself as an Elder of the Universe in MARVEL TWO-IN-ONE ANNUAL #7 (1982). f) The Contemplator (formerly "Mister Buda") revealed his people to be "the star-wandering Elders of the universe" in CAPTAIN AMERICA ANNUAL #6 (1982). In this story, the images of other Elders (Gardener, Kamo Tharnn, Collector, Champion, Grandmaster) appeared as floating heads. In these early appearances, the Elders were described as a "race" or "people." It was not until they were given entries in the OFFICIAL HANDBOOK OF THE MARVEL UNIVERSE (January-December, 1983) that the idea that they were each actually the last survivor of their own separate species was first introduced. This revised origin was first presented in WEST COAST AVENGERS ANNUAL #2 (1987) and further developed in SILVER SURFER Vol. 3 #3 (September, 1987). As of SILVER SURFER Vol. 3 #3 (September, 1987) there were only seven Elders known by name by the Silver Surfer. This number was increased to eleven in SILVER SURFER Vol. 3 #4 (October, 1987) and to a "thousand or so" in QUASAR #17 (December, 1990). The idea that someone was imitating the Contemplator was first presented in QUASAR #37 (August, 1992) and that impersonator was (seemingly) revealed to be a Skrull in QUASAR #47-48 (June-July, 1993). Personally, I have VERY strong doubts that the Skrull Contemplator was actually the same being as the "evil" Contemplator in SILVER SURFER Volume 3. This is discussed in further detail in the Contemplator and Contemplator imposter profiles. Ego is indeed called an Elder in that Silver Surfer story, but he just doesn't fit either of the two most definitive qualifications for the current understanding of the Elders. 2) He did not gain immunity to aging via single-minded obsession. His very nature makes him long-lived. I'm pretty confident that the Elders invited Ego to join them b/c they wanted/needed his power against the Silver Surfer and potentially Galactus. I don't see any way to consider him an Elder of the Universe by any stretch of the imagination, other than "since he's the only one of his kind, he's therefore the last of his race" which really doesn't make sense. It is the same kind of rationalization/plot device as having Haywire immune to knockout gas in reality-616 because he's from an alternate Earth. But, any discussion on the Elders would have to discuss Ego because of the Surfer storyline. Since his first appearance, Ego has had five different origins and the most recent version (in Ultimates 2 (Vol. 2) #8) combines elements from two of his earlier origin stories (from Thor I#228 and Astonishing Thor LS). According to this latest origin, as in his first origin, Ego was a male humanoid named Egros until his homeworld's star went nova and the radiation fused his consciousness with the life-energies of the two billion other members of his race and the physical matter of their homeworld to create a new being, Ego the Living Planet. The twist that this newest origin adds is taking the idea that the Stranger created Ego (and Alter-Ego) and incorporating it into Ego's first origin by revealing that the nova had been caused by the Stranger in order to create something like Ego. If this origin remains canon, then "Ego" really is the last member of his race. Avengers I#174 revealed that the Collector and his wife had a "child" together. In Avengers I#175, Korvac shared minds with "Carina" and learned that she was (or believed herself to be) the Collector's "only daughter." The Collector's entry in OHotMU I#3 states that his wife Matani died "after their daughter had grown to maturity and left them." And Silver Surfer III#3 featured a briefly-resurrected Matani who had died "more than three billion years ago" because she had been "so weary after two billion years." Assuming all these facts are correct, this would mean that "Carina" must be more than three billion years old. Unless, of course, "Carina" was wrong in her belief that she was the Collector's ONLY daughter but, so far, there's no evidence of that. --I don't like Carina and/or Matani being Elders of the Universe strictly because they are associated with the Collector, and the Elders are all supposed to be the sole survivors of their race. Maybe "sole survivor" is an extreme, but "among the last survivors" is good enough; Matani is dead, so she doesn't interfere too much one way or the other. Additionally, there isn't really evidence that they had some single-minded obsession that keeps them going. They were originally referred to as Elders before the concept had fully evolved, when they were supposed to members of the same race. We don't really even know how old Carina is. If the Collector's daughter is an Elder, than what about any offspring of an Elder? The Champion is stated to have tons of offspring and descendants in his OHotMU entry. I would think that the Champion is indeed the last of his own race, whereas all of his children are from mating with beings of other races. However, as far as I know, Matani was intended to be from the same race as the Collector. Nevertheless, they have been referred to as Elders in multiple sources, so they are included in a list/discussion, at least. They are certainly more worthy of consideration than Ego. MAYBE - Explorer references the Grand Astrogator in a conversation with Judicator to support his right to explore the embryonic Origin. Presumably this is a being that has dominion over both of them, and perhaps the leader of the Elders...or someone else altogether. It COULD even be some object (relic) which is sacred to the Explorer. Should the Geometer be counted as one of the Elders of the Universe? According to Epoch, the Geometer was "born about three billion years ago" and is "a member of a long-extinct race." He also demonstrated that he was obsessed with making every universe he encounters "more mathematically perfect" and claimed that he had been doing so for billions of years. He certainly sounds like an Elder to me. --Most sources list the Elders as being more like 5.5 billion years old, but I have to admit that he fits the bill pretty solidly. I don't think there's anything that indicates when the ancient races had to have perished. Just that they were one of the first races to come around after the Big Bang. Maybe the race was much older, and the Geometer was ONLY born 3 billion years ago. If you accept that, he pretty much fits the mold perfectly. 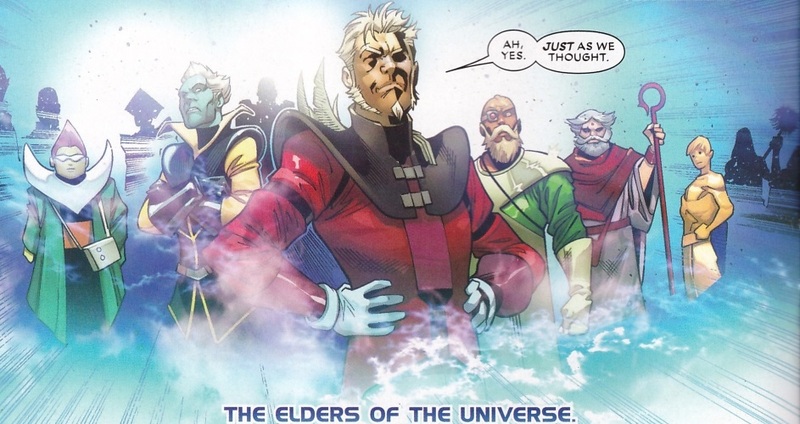 And then there's Elders according to Bendis, who include the likes of the Stranger and the In-Betweener...which comes from not knowing the difference b/t ancient cosmic beings (at least one of whom is actually an abstract being) and true Elders of the Universe. In my opinion, the primary characteristic of any Elder is simply that they are one of the oldest sentient beings in the universe. How they may have achieved their extreme longevity is not important. While some Elders believe that they have lived so long because they have the will to do so and that having an all-consuming interest is necessary in order to avoid succumbing to apathy and dying, there is no proof that this applies to every one of the Elders. Similary, while it has been suggested that having such an obsessive interest does enable some Elders to somehow tap into the Power Primordial in order to give themselves cosmic life forces that maintains their lives indefinitely, there is nothing to say that an Elder's virtual immortality cannot come from other sources. I think the key point is the difference between being an elder being of the universe and being one of the Elders of the Universe. The former is a descriptive term, the latter is a specific, somewhat elite group. Kind of like the difference between the "Elder Gods" of Earth (Chthon, Gaea, Oshtur, Set, etc.) and the various elder races, the Lovecraftian Great Old Ones, etc. Otherwise, you lump in all kinds of unrelated characters. Maybe the Elders themselves chose these requirements, as mentioned below. A second characteristic that does seem to be important is that any given Elder must be the last (or almost the last) surviving member of their race. Exactly WHY this is a requirement has not been revealed but it does serve to keep the Watchers from being considered Elders even though some Watchers are almost as old as the Elders. It's possible that being a "last survivor" is just something that the Elders themselves CHOSE to be a defining trait of anyone who wished to be part of their very exclusive group but this is just speculation.